Over the weekend I managed to get a few things that needed doing. One being the layout in the previous post - it was an idea banging around in my head for a while. I also needed to make a couple of birthday cards - which I quite pleased with the end results. 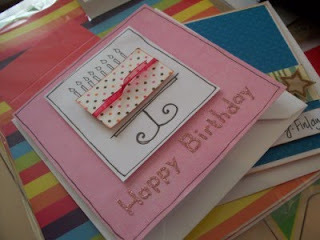 I find now that people 'expect' handmade cards! Sometimes I find it a chore but I really enjoyed these ones! Which reminds me - must make a start on the Christmas cards too!! They were very quick to put together and all made up out of my scrap bag! Plus I finished by blanket for baby. I can now relax as I have completed at least one handmade item for baby!! Though I am now starting on a second, different blanket for baby! LOL! I got the pattern from Ravelry, its a knitting and crochet forum and is full of patterns - some are free and some are at a cost. This one was free, if you search for Triamsu Blanket. You have to register to the site - but it's free to join. There are so many wonderful patterns out there. 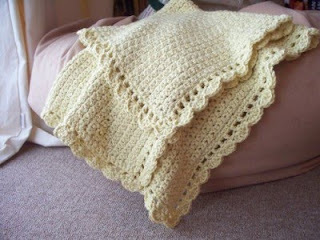 I made this using bamboo yarn - which means its a little thicker but has a nice warmth to it. Its only small but I think will be perfect for the pram or car seat - just as an extra layer. I still have a long list of projects I'd like to complete - but I shall not stress about them and just enjoy making them! One of them is a Merry Christmas Banner. I've sorted out supplies for it and I think I will be able to make it out of left of Christmas paper from last year! Gorgeous blanket, love it! Your cards are fab too, mine look home-made rather than hand-made lol. Great cards and beautiful baby blanket! 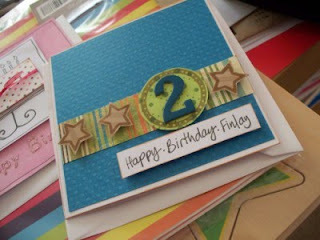 I especially like the colors you used on Finlay's b-day card. Oh fun! And what a lovely blanket! It will be a wonderful keepsake I'm sure. what beautiful cards and blanket! Oh my life that blanket is sooooooo gorgeous. I wish i could knit/crochet. The cards are gorgeous too Leanne.